Galaxy's Edge will open in California in May and Florida in August. The new lands are set on Batuu, a new planet not yet seen on film. On Saturday, Disney revealed more about what fans will see at the new theme parks during a panel at Star Wars Celebration in Chicago. Star Wars fans can finally take a vacation to a galaxy far, far away. Galaxy's Edge, the newest Disney theme park adventure, is opening in about month in California and in Florida in August. On Saturday, during Star Wars Celebration in Chicago, executives from Walt Disney's Imagineering and Lucasfilm revealed details about what fans can expect once park doors open. "It is beyond your wildest dreams," panel host Josh Gad ("Frozen") told fans. "It is the single-most insane thing I have ever seen built in any park." "The scale and scope of it, I don't think any of you are ready for," he said. Galaxy's Edge is part of a $2 billion investment Disney has made into its theme parks. Disney's theme parks and resorts took in more than $20 billion in revenue for its 2018 fiscal year and earned $4.5 billion in operating profit. While the cost of the new Star Wars Parks are significant, Disney executives know "what they are doing," said Bill Coan, president and CEO of ITEC Entertainment. "Most people in the real word would see this as a crazy investment, but it's not," said Coan. According to Coan, Disney should be able to recoup its investment in hotel expenses, food and beverage purchases, impromptu retail purchases and premium services, like fast passes, that can be added onto tickets. "Star Wars" lands Galaxy's Edge will open on May 31 at its California park and on Aug. 29 in Florida. The new lands are set on Batuu, a new planet not yet seen on film. It's a thriving port filled with rogue traders, droids and unique alien species. "When we were trying to figure out what the land should be, we started to explore all the different places we could take our guests like Tatooine or maybe even Mustafar," Doug Chiang, vice president and creative director of Star Wars for Lucasfilm, said during the panel. "When we started designing Black Spire Outpost it wasn't about a single person, it wasn't about Luke or Anakin's journey, it's about your journey," Chris Beatty, executive creative director for Walt Disney Imagineering said. "It's really about you. You are that rogue adventurer. You are that scoundrel. You are that person on the edge of wild space." Disney park guests will be able to explore the planet's Black Spire Outpost and shops as well as pilot the Millennium Falcon on the Smugglers Run ride and take part in an epic battle between the First Order and the Resistance ride. How well guests work together while piloting Han Solo's ship — yes, you get to flick switches and everything — will determine if they return to port unscathed or with a few dents in the hull. "It's up to you and your flight crew to determine the fate of your ship," said Asa Kalama, executive creative director at Walt Disney Imagineering. CEO Bob Iger teased investors in March that the Star Wars Rise of the Resistance ride, which will open at a later date, is "the most technologically advanced and immersive attraction" the park has ever seen. "There is no movie magic behind this," Chiang said. "These are all real attraction experiences and places that guests will actually get to visit." From left to right: Moogan Tea, Blue Bantha, Bloody Rancor and the Black Spire Brew. Oga's Cantina is the local hot spot for food and drinks at the Black Spire Outpost. Patrons can sample braised Shaak roast, oven-roasted Burra fish and smoked Kaadu ribs, as well as a number of alcoholic and nonalcoholic beverages. John Williams, the composer behind "Star Wars" iconic score, has also created a soundtrack exclusively for the park. Additionally, Coca-Cola, the official soda of Disney's theme parks, worked with the company to create stylized Coke, Sprite and Dasani bottles that fit into the world of Batuu. 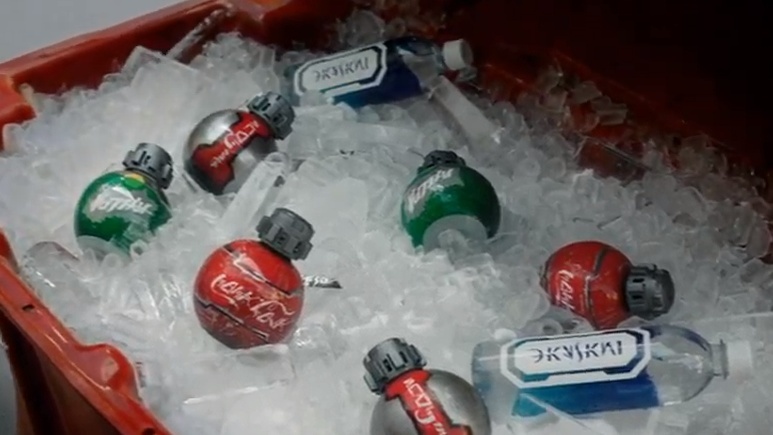 The sodas are reminiscent of thermal detonators from the "Star Wars" films and feature the name of each brand in Aurebesh, the fictional language of Star Wars. "The Disney guys do an absolutely great job developing the attraction itself," Coan said, noting that a lot of the people who will come to this park will be "Star Wars" fans. Still, he noted there will be an equal or larger number of people who are not fans of this universe, "but will enjoy the attraction based on the quality of the immersion."